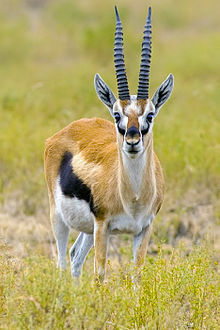 The Thomson's gazelle (Eudorcas thomsonii) is ane o the best-kent gazelles. It is named efter explorer Joseph Thomson an is whiles referred tae as a "tommie". 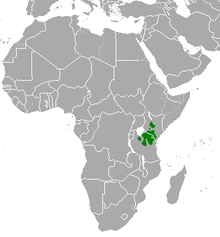 It is considered bi some tae be a subspecies o the reid-frontit gazelle an wis formerly considered a member o the genus Gazella within the subgenus Eudorcas, afore Eudorcas wis elevatit tae genus status. Thomson's gazelles can be foond in nummers exceedin 500 thoosand in Africae an are recognized as the maist common teep o gazelle in East Africae. ↑ 1.0 1.1 IUCN SSC Antelope Specialist Group (2008). "Eudorcas thomsonii". The IUCN Red List of Threatened Species. IUCN. 2008: e.T8982A12946551. doi:10.2305/IUCN.UK.2008.RLTS.T8982A12946551.en. Retrieved 13 January 2018. This page wis last eeditit on 21 Mey 2018, at 05:45.